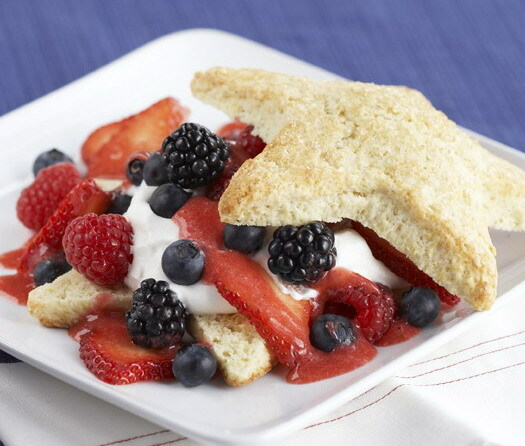 Homemade shortcakes are the icing-on-the-cake for fresh berries. Making shortcakes is similar to biscuits or scones. It’s just a quick-stirred dough that’s scooped, or patted into a round and cut into wedges, or cut with cookie cutters of your choice. This shortcake is lightly scented with lemon zest for a little zing, and some of the strawberries are pureed with a splash of lemon juice. My daughter’s birthday is on the 4th, and we’ll be celebrating with these star spangled shortcakes and Blackberry Mojitos that I developed for Driscoll’s berries. Both the shortcakes and strawberry sauce freeze beautifully, so double the recipes if you like! Preheat oven to 400ºF. Line a baking sheet with parchment paper or coat with cooking spray. Combine flour, granulated sugar, zest, baking powder and baking soda in a large bowl. Cut in butter with a pastry blender or two knives until mixture resembles coarse meal. Stir in buttermilk just until dry ingredients are moistened. Place dough on a lightly floured surface. Knead gently 3-4 times. Pat or roll to 1/2-inch thickness, dusting lightly with flour to prevent sticking. Cut 8 stars or circles using a 3-4-inch diameter cookie cutter. Place on prepared pan. Moisten tops with water and sprinkle with sugar crystals. Bake 12-14 minutes or until golden brown. Place cakes on a wire rack to cool. To make strawberry sauce: Blend half the strawberries, powdered sugar and lemon juice in a blender until smooth. Can be made in advance and refrigerated. Slice and reserve remaining strawberries to serve with shortcakes. To serve, using a serrated knife, cut shortcakes in half horizontally. Place bottom halves on dessert plates. Top each with a dollop of whipped cream. Surround with blackberries, raspberries, blueberries and reserved sliced strawberries. Drizzle with 1-2 tablespoons strawberry sauce and add shortcake top. Serve. An original recipe by Rosemary Mark for Driscoll’s. Store berries in the refrigerator, unwashed, and use within a few days of purchase. Place in a colander and rinse gently with cool water just before serving. It only takes a few minutes to whip real dairy cream and there’s no substitute for the taste of real whipped cream with fresh berries. About 2 tablespoons sugar lightly sweetens 1/2 pint whipping cream, or adjust to your preference for sweetness. Cream whips to double it’s volume. ie: 1 cup cream (1/2 pint) whips to 2 cups. For best results, take cream straight from the refrigerator and whip in a chilled bowl. To download coupons (scroll to bottom of page) for discounts on real dairy products .